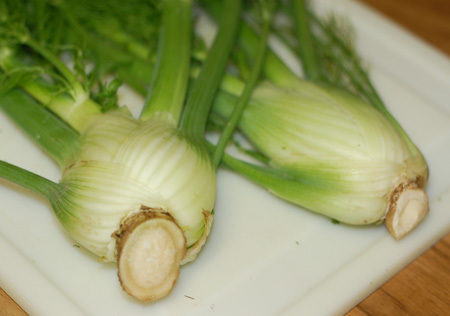 Having discussed a few methods for disposing of fennel fronds, and considering a host of others—infused into a vinaigrette for salad, candied as a garnish, or mixed into fresh pasta dough, for instance—I eventually had to get around to the main event, the fennel bulb. Could you tell I’ve been avoiding it? Licorice flavor and celery texture is just not to my taste. The one time I cooked with fennel before, I braised it using a Zuni Cafe recipe, which in most cases would be a slam dunk. But standing alone as a side dish, the licorice flavor of the fennel was still too predominant for us. 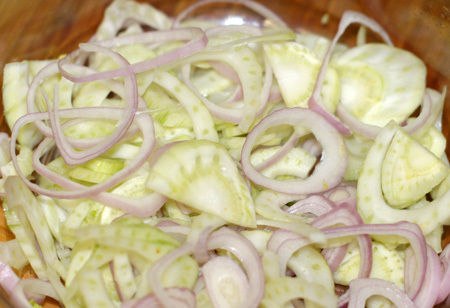 This time around, I used one bulb of fennel to make pickles. No, that is not a typo. I made fennel pickles. They were thinly sliced and tossed with shallot, then dunked in a sugar-salt-vinegar solution with mustard seed, coriander seed, peppercorns, a few red pepper flakes, and some fresh mint. A day or two later, I screwed up my courage and took a nibble. The sweetness, tartness, aromatic mint, and slight heat of the brine all stepped up to moderate the anise flavor nicely, but unfortunately there was also too much salt. After a few more tentative samples, I decided to try ditching most of the pickling liquid and replacing it with water to combat the salinity, but then the pickles went back to tasting more like fennel. That issue, combined with the fact that I had no idea how to use the pickles once they were done, consigned them to the back of the fridge. I feel as though I should try it one more time with less salt, just to give it a fair shake, but any suggestions about how to use pickled fennel would be heartily appreciated. Salad, maybe? At any rate, I had one more bulb of fennel to use up, and I just didn’t have the heart to try another uncooked application like a slaw. I decided the best approach would be to simply slice it really thin, caramelize the heck out of it in a hot skillet, and let it simmer into a fully tender state with a bit of chicken stock. Then I buried it in creamy pasta. 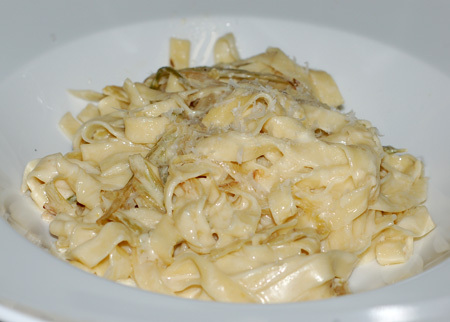 One of the few foods I eat at restaurants is fettuccine alfredo, that classic white-on-white-on-white pasta dish (read: Parmesan-on-cream-on-pasta). Sometimes I can be talked into the addition of chicken, or more rarely, broccoli. Although I order it everywhere it is offered, I have only very rarely made this meal at home, in part because when I make it myself, I have to consider the amount of fat I am eating, and the lower fat variations just aren’t the same. For the sake of hiding that fennel, though, I made an exception. While the fennel softened, I boiled water and rolled out a batch of fresh pasta. Cream and butter went into the skillet when I dropped the pasta, and then I tossed everything together with a cloud of freshly grated Parmesan to let the sauce penetrate my fettuccine. The fennel was barely even visible in the finished dish, pale green slivers clinging to the strands of pasta, but it added a very subtle flavor that wasn’t off-putting. In fact, Jeremy happily gobbled his plate down, unable to identify the mystery vegetable, which in this case, was a good thing. Melt butter in a skillet over medium high heat; add sliced fennel and a pinch of salt, and saute until golden brown and caramelized in spots. Add chicken stock, reduce heat to medium, and cook until stock has evaporated. (If your fennel is not thinly sliced, you may want to cover the skillet for several minutes to promote softening before it boils off.) Turn the heat down to medium low and add the cream, another good pinch of salt and some grinds of pepper; let it come up to a very slow simmer and thicken slightly. Meanwhile, get a large pot of salted water boiling and cook your fettuccine. Using fresh pasta, it will only need a minute or two to cook. Drain the pasta or use a spider to transfer it to the skillet. Toss once to coat with the creamy fennel, then add the Parmesan and toss again, until any looseness in the sauce has been absorbed into the pasta. Serve immediately, topped with a bit more Parmesan cheese and some chopped fennel fronds (if you want to clue in your eaters). 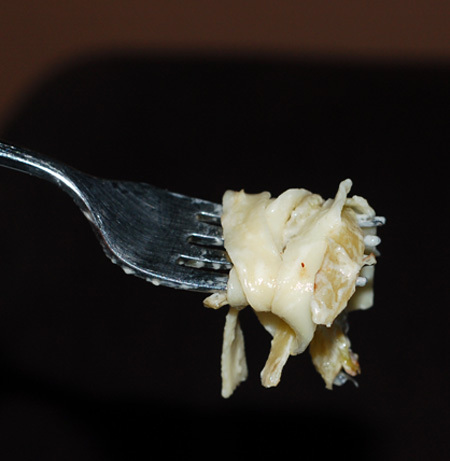 Warning: once you’ve tasted Fettuccine Alfredo with bit of fennel, the dish will seem bland, even unfinished, without it. I doubled the recipe, used one large bulb of fennel, added a bit of white wine, and used 1/2 c parmesan and (gasp) 3/4 c Italian shredded cheese blend. I could eat this sauce like soup! You have opened up a magical alfredo wonderland for me. I tossed with chicken and angel hair, and think the chicken almost detracts from the amazing taste of the sauce. It’s THAT good.